Summary: Our little girl is growing up: Babymouse has started middle school, and she finds some of the universal difficulties: bad cafeteria food, mean girls, and difficulties managing her curly whiskers. Things start to look up, though, when she joins the Film Club and is chosen to direct the club’s first movie. 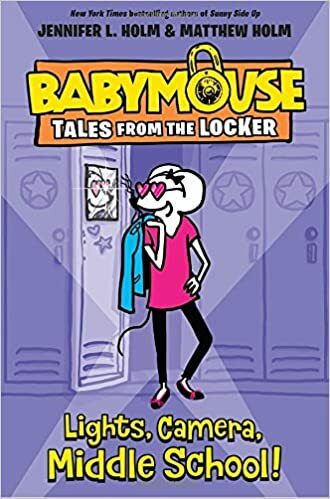 Backed by a remarkably supportive group of friends, Babymouse dives into the process with her usual enthusiasm, extracting herself from one embarrassing situation after another. The final screening is an unexpected hit with the middle school crowd, but when Babymouse is introduced as the director, she trips over her new dress and falls on her face as she tries to get onstage. Typical. Much of this new series is a regular chapter book, but there are plenty of illustrations, as well as occasional comics. 208 pages; grades 2-6. Pros: Babymouse fans will cheer at the advent of a new series, and the format will allow readers to move up a notch from the graphic novels. Cons: Librarians will have a tough time deciding whether to shelve this with graphic novels or regular fiction.